Stories shape civilizations. We live our lives in the present style because of the way we understand the stories we have inherited. Mankind has gathered a wealth of stories from those who lived in the past around the globe, though told in diverse languages. How we understand those stories often serves as the basis of the lives we build for ourselves. If we understand those stories differently, our lives will also change radically. Born and brought up in the Christian religious tradition, I have heard many stories of the Bible from my childhood, and most of them have become part of my subconscious mind. I also received an understanding of those stories from older people as I grew up, and this understanding shaped my life. Later I realized that it is possible to have a better and nontraditional interpretation of each of those stories, since they helped me in laying a stronger foundation for my life. A better understanding of these stories can transform the lives of human communities as well. Take for example, the story of Adam and Eve. The life of almost half of all the people on Earth is built upon this one story, for it is basic to the belief systems of Christianity, Judaism, and Islam. A slight change in the way this story is understood can make tremendous changes in the life of half of humanity. 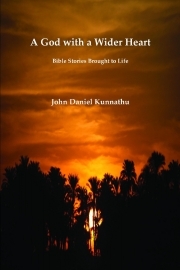 This book is a collection of 18 Bible stories retold by the author. They have tremendous power to deeply influence human hearts and transform human lives. 1. You can read or tell a story from here to your child or your sundayschool class. 2. You can lead a Bible study using a story here. Or all participants may read a story from here, and then have a discussion based on it. I remember that blessed day just as yesterday. I met Jesus, my savior, that day, and it is the one greatest day in my whole life. The blessed Lord gave me the water of life, and I have been living in heavenly joy from that day. I have told this story to countless people since then, and I am excited to share the story with you as well. I was living in Sychar, my hometown, then. It is one of the major cities in Samaria. Samaria lies in between Judea and Galilee. Although the people of all these three places belonged to the same religion, there had been a division among us. We all worshipped Yahweh, we all accepted the Torah as our holy scriptures, and we all considered Moses as the most important prophet. The one important difference that I noticed was that we worshipped at two different places. The people of Judea and Galilee worshipped Yahweh in their temple in Jerusalem, and we, the people of Samaria, worshipped Yahweh in mount Gerizim. They, the Jews, claimed that Yahweh dwelt only in Jerusalem and not in Gerizim. We, the Samaritans, claimed that Yahweh dwelt in Gerizim. If their claim was right, then Yahweh had nothing to do with the people of Samaria. On the other hand, if our claim was right, then Yahweh was our God, and not theirs. I am not exactly sure how such a division originally occurred. If we had lived entirely in isolation from them, this difference wouldn’t have mattered much. But we, the Samaritans, lived in Samaria, with them on both sides of us. The geographical position of Samaria placed us in close contact with the Jews. They frequently had to travel between Judea and Galilee, and many of them passed through Samaria. Those who strictly held their religious views tried to go around Samaria. They didn’t mind traveling a few extra miles to avoid our sight. The most religious of them thanked Yahweh daily for not creating them dogs or Samaritans! They saw us at the same level of street dogs. Although this attitude of the Jews pained us, we in general had an attitude of sympathy for them. We were willing to see them as our brothers and sisters although they looked down on us. They also claimed to be the pure descendents of Abraham, Isaac and Jacob. They accused us for intermarrying with other races. Samaria was conquered and occupied by several nations one after another, which might have caused such racial mixes. Perhaps, we, the Samaritans, didn’t care much for such a racial purity. We were more willing to see people of other races as our brothers and sisters. That day as usual I went to the well to fetch water, and the sight of a Jewish Rabbi there was unexpected. It was almost noon, and the Sun was blazing in the sky. The Rabbi was obviously tired after a long walk in the Sun. Here is a Rabbi who could tolerate the sight of Samaritans! I thought. He looked very young and handsome. He could easily walk a few extra miles if he wanted to avoid the sight of the Samaritans. But he was willing to walk right through Samaria. Not only was I surprised, I was also curious. Although I was curious, I pretended to ignore him, and began to draw water from the well. I might be just a dog in this man’s eyes! He might even call me a dog! “Could you give me some water to drink, please?” It took a few moments before I realized that those sweet words came from the mouth of that Rabbi sitting there. I couldn’t believe those gentle words came from him. I had never heard the voice of a Rabbi. No, not even the voice of a Jewish male. No Jewish male would talk to a woman in public. The strictly religious male Jews thanked Yahweh every morning not only for not creating them dogs or Samaritans, but also for not creating them female. They believed that masculinity was the ideal, and that femininity was a deviation from the ideal. Yahweh, the ultimate being, was a male, and Adam, the first human being was a male. Female was created by Yahweh only to satisfy the need of the male, and not as a part of the original plan of creation. There was nothing unusual if that Jewish Rabbi treated me as a street dog, for I am a Samaritan female. Contrary to all my expectations, this Rabbi talked to me as a human being. Instead of looking down on me, he had the magnanimity to ask me for water. Hearing my question, a smile bloomed on that face. It was as if he was expecting my question. He knew as much as I knew about the enmity between the Jews and the Samaritans, but he was someone who rose above and beyond the deep gulf that separated our communities. My mind was filling with admiration for him. A question rose in my mind: Who is this man? As if he read the question within my mind, he told me: If only you knew who I am, you would ask me for the water of life! He was there asking me some water to quench his thirst, but at the same time, he was offering me the water of life. I am sure he was really thirsty. But he was also making use of that situation to pass on to me the key of a meaningful life. How stupid I was to take his metaphorical statement literally! The water he offered me was the water to quench the thirst of my soul. I do not claim that I understand all that he meant by that statement; however, I can tell you how I understand it now. Look at this fig tree under which we are sitting, and compare it with the one you see up there. Both of them came out of the same kind of seed, and both of them are approximately the same number of years old. However, this one is very big, full of fruit, and gives shelter to so many birds. That one is feeble, and has no fruit. This tree has grown to its full potential, but that one hasn’t. We human beings and societies are like the trees in the garden of God, and we are expected to grow to our full potential. This tree could grow mainly because it is close to this stream, and it gets water. If we human beings need to grow to our full potential and become fruitful, we need something like water, and that is what Jesus offered me. I will explain this further, but now let me continue with the story. Instead of understanding Jesus’ statement metaphorically, I took it literally, and it made me make a funny response. I thought what Jesus was offering me was some kind of magical water that would quench my thirst forever so that I won’t have to walk all the way to that well every day to fetch water. When I accepted the offer, Jesus asked me to bring my husband. Because I kept on interpreting Jesus' words literally, probably Jesus thought that my husband could understand him better. There could also have been another reason. An individual cannot have a fruitful life in isolation, but only as a part of a community. Family is the immediate community one belongs to, and Jesus asked to include my family in my search for a fruitful life. But my family consisted of only me and my children. When I told Jesus I had no husband, he gave me even more information about me. He said that I had had five husbands, that I had a man in my life who was not my husband yet. That is when I was convinced that this man I was talking to was a prophet of Yahweh. He had the ability to see the past and the future. He could see what others couldn’t. You might be wondering how I had had five husbands. I didn’t have them all at the same time, but one after another. I lost each one of them one way or another. When I met Jesus, there was a man in my life, and he was going to be my sixth husband. It was unusual for a woman to have such a lot of husbands in a lifetime, and therefore, I was a hot topic of talk in our town. Many people avoided my company, and it was painful to me. Jesus was not passing a judgment on me when he said that I had had five husbands. Jesus knew that about me even before he started talking to me. However, instead of avoiding me or condemning me, he was willing to treat me as a human being. That acceptance, that love, although I didn’t deserve it—that was the water of life Jesus gave me. In Jesus I saw our heavenly father who accepts and loves us. Yahweh forgives all our mistakes no matter what. Receiving that love and forgiveness from Yahweh is the water of life that makes us fruitful. When I received the love and forgiveness from God, I was willing to give love and forgiveness to others as well. I wanted to run back right away and share the water of life with everybody in my city. I was willing to love and forgive all people although they despised me. Jesus told me that neither of these is the true way to worship Yahweh. How can Yahweh, the creator of the whole world, and the father of all the people be confined within a mountain or within a man-made building? People may worship Yahweh anywhere, but nobody can claim that theirs is the only true worship. Such a claim is far from the truth. Any attempt to limit the infinite Yahweh within our brains, within our beliefs, and within our buildings is much more poisonous than a cobra’s venom, and it can exterminate large communities. Jesus asserted that it was time to rise above and beyond such petty and stupid claims about Yahweh, and worship the heavenly father of all in truth and in spirit. The messiah! Before my eyes! What did I do to deserve this vision? My heart leaped within me with joy. I didn’t know what to say. Then I noticed a few men approaching us. Immediately I identified them as Jesus’ friends. They were carrying bags. It seemed that they had brought food for the master. I knew that Jesus was going to be there at least until they all finish eating. Indicating to Jesus that I would be back soon, I ran back to the city leaving my water jar there. As I was running with excitement, all the people who saw me could easily tell that I was a different person altogether. They had never seen me that joyful and excited. They all turned to me to hear the good news. I said, “I saw someone. He told me all my past to me. Never have I seen such a wise man. It seems that he is the messiah. He is right there at the well.” Many of them rushed to the well to see Jesus, and I went along with them. Hearing him speak, they were even more convinced that he was the messiah. They requested Jesus to stay with us in Sychar, and Jesus accepted the invitation. We had the honor of hosting him for two days. Once a leper from Samaria was so fortunate as he was healed by Jesus. He was in a group of ten lepers. The others were all Jews. When Jesus saw them, he felt pity for them, and sent them healing right away. While they were going to the priests to be certified, they realized that they were healed fully. The Jews didn’t care to go back. But the Samaritan turned around, went back to Jesus, and fell at his feet to say thanks. Jesus noticed that only a Samaritan cared to go back to thank Jesus. Once Jesus said the story of a good Samaritan in response to a question. A commandment says, “Love your neighbor as yourself,” and based on this, someone asked Jesus, “Who is my neighbor?” Jesus’ response was a story. A Jew traveling from Jerusalem to Jericho was caught by robbers, and was left at the roadside half-dead. A Jewish priest and a Levite came that way, but did nothing to help. Then came a Samaritan. Although the one lying at the roadside was a Jew, he was kind-hearted to save his life. He rose above the petty differences that separated the two communities, and showed kindness to his fellow human being. Jesus was challenging us to see all human beings as human beings. Jesus did not distinguish between a Jew and a Samaritan. He did not distinguish between male and female either. All were God’s children for him.